It seems to me that as science has expanded our knowledge of the vastness of God's creation, of its breadth and length and height and depth (so to speak! ), so too should our awe of God--and our gratefulness for his lovingkindness--increase. Should God have denied mankind the opportunity to discover for itself the amazing and magnificent ways in which He designed the cosmos and its inner workings? No, God left it to us to develop our understanding of the details of His creation; there was no need to distract from more essential truths with what would have been hopelessly confusing lectures on astrophysics and evolutionary biology. If one finds it disconcerting that the earth, rather than being at the center of things, is but a small rock orbiting a minor star on the outskirts of a humdrum galaxy, ask yourself this: do you, like Nathanael, think nothing good can come from a hick town like Nazareth? See how our very placement within creation is a metaphor! A millstone around the neck of any who would intimidate one of the little ones from studying science, and make them feel that in so doing they are betraying their faith! But I digress. In his preface, Parry makes it clear that he is a "Bible-believing Christian" who believes that "the books of the Bible are divinely inspired and together are authoritative as Holy Scripture." However, "it remains the case that biblical books were written by ancient people in ancient contexts, and we need to give space to hearing them as such. Doing this may well be disorientating for believer; indeed, it can often have the effect of distancing the Bible from us and making it seem very strange and alien...[but] the act of distancing Scripture from ourselves...can have the useful function of allowing it to confront us again in its very strangeness; giving it breathing space to say something different and surprising to us...My prayer is that by the end of the book you will not be thinking that the Bible is old and out of date but that it is excitingly relevant to our modern understandings of the world in which we live." An ambitious goal; but for readers like me, Parry's prayer has been granted. The first two parts of this four-part book are devoted to a "tour" of the Biblical cosmos, a thorough discussion of how Scripture represents each of the "zones within the heavenly and earthly realms." Throughout these chapters, Parry shows the similarities and differences between the Biblical viewpoint and the those of other ancient cultures. Thus, in his discussion of the sea (dividing the earth into land, sea, and Hades/Sheol), he includes an overview of the "primal sea" featured in Egyptian and Mesopotamian mythology, and how Isaiah likely drew on Canaanite mythology in his description of Jehovah slaying Leviathan, "the dragon that is in the sea." (Isa 27:1) "[S]ea dragons," writes Parry, "personify the chaos that must be defeated and put in its place so that order and life can flourish...Leviathan...represents the forces of chaos woven into the very fabric of God's good creation...God is the divine warrior who comes to deliver his chosen ones. Even in such contexts there are echoes of creation through conflict--such echoes come along with the ancient Near Eastern motif that has been borrowed--but in the Bible they usually become images of new creation through salvation." Throughout the book, Parry's writing is saturated with quotes from Scripture and, where helpful, from other ancient texts. On a whimsical note, I have no reason to think that the author is either a Kabbalist or student of theoretical physics (or both! 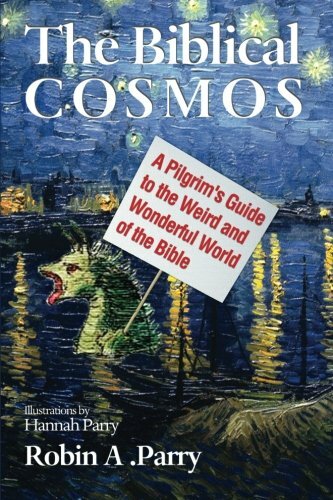 ), but merely observe that Part III of The Biblical Cosmos begins on page 137, a number of exquisite significance in both of those fields. Be that as it may, Parry begins this section, entitled The House of God: Temple and Cosmos, by noting that the New Jerusalem described by John "is not merely a city that contains a temple (like Jerusalem), but the city itself is a temple." Why, Parry then asks, would "a vision of a temple count as a vision of a new heaven and a new earth?" In answering this question, Parry once again looks not only at the culture of the Old Testament Hebrews, but at other ancient Near Eastern societies. "Not only was the temple the biblical cosmos writ small," Parry writes, "the biblical cosmos was the temple writ large. In other words, in the world of the Bible, the cosmos is God's house." The conclusion of Part III focuses on Christ in the Cosmos, showing "how the story of Jesus is fundamentally connected with the contours of the biblical universe...played out on all the stages of heaven and earth...between the highest heaven and the pit of sheol and back again." Part IV, Can We Inhabit the Biblical Cosmos?, presents an exceptionally satisfying conclusion to the book. Parry begins by considering what many of us believe, that "God accommodated his revelation when speaking to ancient people. He adapted his communication to their understandings of this world." Sure, he says, that is "fundamentally correct." But Parry argues that stopping there misses the richness of God's revelation: the "metaphysical and metaphorical truth of myth." So, for example, here is just a taste of Parry's musings on the cosmic temple: "[T]he physical temple in Jerusalem was a "thin place" in which the gap between it and the heavenly temple was closed during the performance of sacred ritual...The Jerusalem temple thus served to mediate sacramentally invisible divine reality to ancient Isrealites. In just the same way, to conceive of the whole cosmos as a temple is to conceive of it as a place in which the visible and "ordinary" point beyond themselves to the invisible dimensions of reality, and in which at key moments God can manifest his invisible glory through the visible." Parry doesn't pretend to have all the answers, but engages us with thought-provoking speculations on such mind-numbing questions as where Jesus incarnate body could be if heaven is a "non-physical place." At one point, talking about the significance of the stars, Parry writes, "This is metaphysics, and shifting scientific understandings of the physical organization of the cosmos don't touch it." This rather puts me in mind of George MacDonald's unspoken sermon, The Truth. A fact, MacDonald points out, is not a truth. "The truth of the sky," says MacDonald, "is what it makes us feel of the God that sent it our to our eyes...We are here in a region far above that commonly claimed for science, open only to the heart of the child and the childlike man and woman. Facts and laws are but a means to an end; in the perfected end we find the intent, and there God....science is but the backward undoing of the tapestry-web of God's science; it will never find the face of God..."
The Biblical Cosmos is an engaging and inspiring book, which I heartily recommend.